Ya'll gotta test out the new, awesome, Kanakuk webpage. Click on the links below. Leave comments of what you would change, hard to navigate, or any suggestions and I'll pass it on to our marketing/software people. Don't know the first thing about Kanakuk Kamps? Discover it! Wonder what the hype is about? Feel the Impact! Need a new friend? Meet the People! Want to see Joe White in a suit? Check it Out! Want to ask a question or tell your Kanakuk story? Why don't you - Sayso? We've hidden a treat on the new . Just type the letters "JOY" on your keyboard to find it.Share any of these pages with a friend! Just click on the little envelope at the bottom of the website. 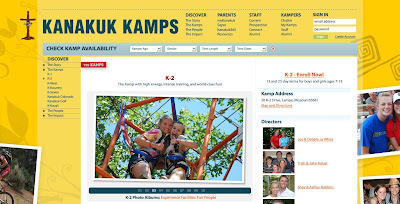 Today, you get a sneak peek at the nearly ready, all brand new, Kanakuk Webpage. We need you to check it out, kick the tires, try to find problems, and let us know. When you find a flaw in the new website just click on the ladybug at the bottom of each page and send us a short description of the problem and we'll fix it. Some known problems:Internet Explorer(IE) 6.0 looks bad, messes with our flash content, doesn't like going places, etc. If you are running IE 6, upgrade to Firefox or the latest version of IE. We'll eventually work all the IE 6 bugs out.You can login with your regular Kanakuk id (probably your email). You don't need it to get around most of the site but if you want to track your Sayso conversations or get to any of the personal stuff you'll need it. Forgot your password? Click on the green "Login" button and follow the links so we can send it out to you. Thanks for helping us with this. This has been a huge project and we really have poured ourselves in to it. Our vision is that you find it easy to use and a place that has a lot of value for your life and your Kanakuk experience. Today we lay the foundation for that. extremely cool, but very confusing.